Baseball is a funny game. Johnny Damon, the man who destroyed the championship aspirations of the New York Yankees in 2004, was the same guy creating havoc at the plate and on the base paths during their thrilling 2009 championship run. He combines an all-out, ultra-competitive approach to baseball with a no-worries, ultra-relaxed attitude toward everything else—which has helped stir things up in a buttoned-down clubhouse. A self-proclaimed “idiot” in Boston, Johnny has been revealed for what he is in the Bronx: a smart and savvy winner. 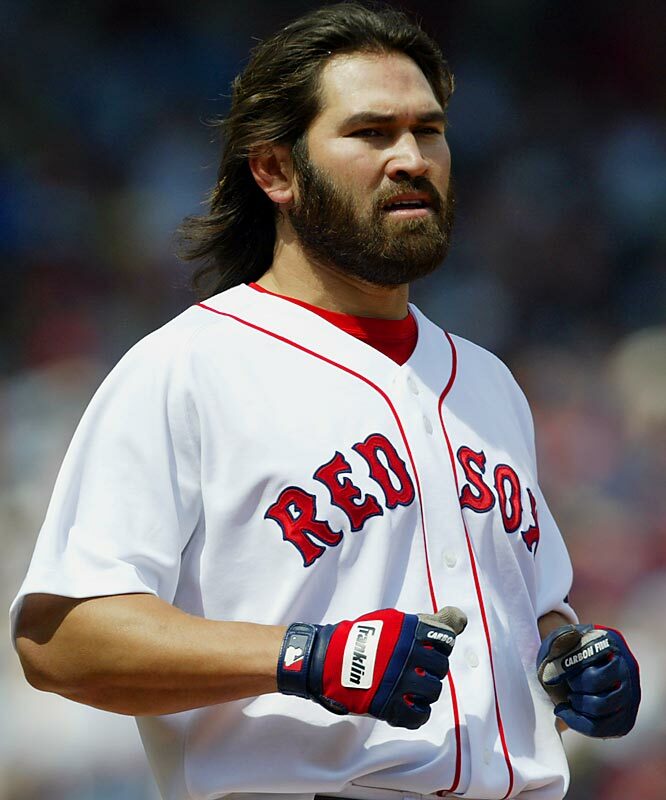 Johnny David Damon was born on November 5, 1973, in Ft. Riley, Kansas. His parents, Yome and Jimmy, met in Southeast Asia. Jimmy, an American army staff sergeant, was stationed there. Yome is Thai by birth. ThE couple already had one child, James Jr., when Johnny came along. The family lived on bases in Okinawa and in Germany before settling in Orlando, when Johnny was still a pre-schooler. The children in Johnny’s Florida neighborhood were not particularly open-minded. They were mistrustful of a boy who was the product of a mixed-race marriage, especially with parentage from as exotic a locale as Thailand. Shy and soft-spoken, Johnny would often stutter when he got excited. He endured his share of teasing over the years, but his positive outlook buoyed him during rough times. Johnny grew up cheering for the Tampa Bay Buccaneers. The team had a couple of good seasons in the late `70s and early `80s, but the Bucs mostly struggled as one of the NFL worst franchises. Although he rooted for quarterbacks Steve DeBerg and Steve Young, it was the uniform that Johnny really loved. He was a pretty fair football player as a kid, and his bright orange Tampa jersey was a key part of his wardrobe. First and foremost, however, Johnny was a baseball fan. His favorite player was Cal Ripken, Jr. He and his dad went to spring training games in nearby Osceola, plus the occasional minor league contest, but Johnny did not see a major league game in person until he played in one. Johnny always had great speed. He first realized how fast he was in the fourth grade, when a group of girls began chasing him at recess. He wasn’t sure what to do, so he just took off. Johnny amazed himself with his explosive acceleration. He used his speed to great effect in Little League and beyond, catching the eye of Danny Allie when he was in seventh grade. Allie coached Orlando’s Dr. Phillips High School baseball squad, one of the best in the state. He admired how hard Johnny worked at his game, noting that he always ran to his position while other kids walked. Allie also liked the way Johnny kept his hair clean cut—he looked like a ballplayer. Little did the coach know that Jimmy had to bribe his son with $20 bills to keep his hair military length. Johnny was one of those kids who reached his full height and weight very quickly. By age 13, he stood six feet and weighed 180 pounds. Thanks to his strength, speed and decidedly mature look, Johnny was able to bluff his way into a baseball league for 16-, 17-, and 18-years-olds. To put the final touch on the ruse, he signed up as his older brother. Johnny enrolled at Dr. Phillips in 1988. Already a remarkable athlete, he also became a straight-A student. He made the football team that fall and eventually developed into one of the school's best players—a fast, hard-hitting safety who had Division-I talent. In the spring of 1989, Johnny won the varsity starting centerfield job as a freshman for the Mighty Panthers. He would go on to be the first four-year starter in school history. Johnny had a solid year and began drawing attention from big-league clubs as a sophomore. Ironically, however, It was at a 1990 track meet that GM Allard Baird of the Kansas City Royals first saw him. Johnny, who also happened to be the best track athlete at Dr. Phillips, was a devastating sprinter in the 100- and 200-meters. After making a special trip to see the teenager on the diamond, Baird was dismayed to find that he was running track that day. But Johnny impressed by hustling over to the baseball team the moment his events were done. Baird hoped Johnny would stay under the radar so the Royals would have a shot at him in a couple of years. And then it all came apart. Johnny stopped at a fast-food joint on the way back from a track meet and soon became violently ill. A week later—and 15 pounds lighter—Johnny rejoined the baseball team. Opposing teams still chose to pitch around him, and when the Mighty Panthers started struggling, Johnny tried to do it all himself. His batting average dropped to .306 for the season, with five homers and 22 steals. Not bad, but not the type of numbers that make scouts drool. Even so, thanks to coach Allie’s shrewd campaigning, Johnny was honored as Florida’s top player. Johnny was extremely disappointed and considered giving up baseball for a college track career. Several schools were interested in him as a sprinter, and he toyed with the idea of playing college football, too. There is little doubt he could have found a spot in Florida’s program, even as a walk-on. When baseball’s draft day rolled around, Johnny’s name was nowhere among the top picks. As the first round wore on, he kept dropping down the board. The Royals, who had grabbed Michael Tucker with the 10th overall pick, had five supplemental selections coming their way as a result of free agent losses. They used one of those choices on Johnny, making him the 35th player taken in 1992. Johnny signed for a $300,000 bonus and joined the short-season Gulf Coast Royals under manager Mike Jirschele. He tore it up, batting .349 and swiping 23 bases in 58 games. He led the league in hits, total bases and slugging, and the Royals went 41-18 to win the pennant. After being named the circuit’s #1 prospect, Johnny graduated to the Class-A Midwest League in 1993, where he played for the Rockford Royals under Jirschele again. In 127 games, he hit .290, stole 59 bases, and claimed honors as the league's third-best prospect. The 1994 season found Johnny playing high-A ball for Wilmington of the Carolina League. At age 20, he blossomed into a legitimate four-tool player, batting .316 with power and excellent speed. Managers in the CL recognized Johnny by naming him the best defensive outfielder, best hitting prospect and most exciting player. Johnny came by his numbers honestly, staying ahead of the pitchers as they tried different approaches against him. His stats could have been even better had it not been for a bruised quadriceps that slowed him down for a couple of weeks and sidelined him for a couple more. The only weak part of Johnny's game was his throwing arm, which was accurate but not powerful. As for Johnny’s distinctive swing, the Kansas City organization decided not to mess with it. His mechanics seemed stiff and sometimes unsound, but his hand-eye coordination was so good that he was able to compensate. What really turned heads was Johnny’s ability to relax at the plate and execute a plan in the batter’s box. This told management that he was just a year or two away from competing for a major league job. The Royals promoted Johnny one level in 1995, assigning him to the Wichita Wranglers of the Texas League. Two months into the season, he was among the league leaders in five major offensive categories and had already eclipsed the team mark for triples with nine. It was clear at this point that J’ohnnys next move would be to the majors, not Class-AAA, so he began watching the big club with great interest. What he saw wasn’t particularly pretty. The Royals had made great strides under manager Hal McRae, fashioning winning records with patchy talent. Despite a respectable record in ’95, however, Kansas City ate the dust of the Cleveland Indians, who dominated the AL Central. Veteran Vince Coleman, meanwhile, was wearing out his welcome with the Royals. On August 12, he was shipped out of town along with veterans Chris Jones and Pat Borders. Johnny now had his shot. By then, his numbers for Whicita were .343 with 16 homers, 54 RBIs and 26 steals—good enough for Texas League MVP honors. Johnny was a revelation for the Royals. He got three hits, including a triple, in his first game, against the Seattle Mariners. In a contest against the Texas Rangers, he challenged Pudge Rodriguez twice and won, stealing his first two bases in the big leagues. In a post-strike season when baseball fans were looking hard for something to like about the game, Johnny gave them something to cheer about. He played hard and hustled, and his shy demeanor totally disarmed the press. The Royals nudged their way into the Wild Card race, taking a brief lead in late August after Johnny hit a dramatic ninth-inning homer against the Milwaukee Brewers. But the team finished sluggishly, at 70-74. Johnny’s final numbers—.282 with 32 runs, 19 extra-base hits and seven stolen bases in 47 games—underscored his tremendous promise. In 1996, he held his own with a .271 average and 25 steals. In 1997, Kansas City continued its lackluster play, and Boone was fired in July. His replacement, Tony Muser, sat Johnny down for a pep talk, telling him to focus on becoming a winning player despite the club's losing ways. Although Johnny’s overall stats showed minor improvement, he displayed solid progress against lefthanders, raising his average to a respectable .248. Johnny, who owed some of the credit to Muser, celebrated when the team removed the term "interim" from the manager's title. The 1998 season saw a slight jump in the team’s record—and a big leap in Johnny’s performance. He established new career highs in most categories, reaching double-figures in doubles, triples and homers and scoring 100 runs for the first time. Most notable was how Johnny began to turn on inside pitches. His 18 home runs were more than he had hit in his first three seasons combined. In 1999, the buzz in Kansas City revolved around the team’s outfield. Jermaine Dye, acquired in a deal for Tucker, was finally healthy and locked in. Carlos Beltran, who had a cup of coffee with the team in `98, was inserted in centerfield. Johnny was shifted to left. The trio formed the best young outfield in majors. They led all of baseball in hits, doubles, triples, RBIs and assists. Beltran won Rookie of the Year honors, Dye led the team with 27 homers and 119 RBIs, and Johnny topped .300 for the first time and swiped 36 bases. The rest of the Royals, however, were an unmitigated disaster. Trying to limp along on a $25 million budget, Kansas City had no depth and a putrid pitching staff. The team’s only other above-average player was Mike Sweeney, and the Royals finished at a miserable 64-97. Johnny made one major adjustment as he headed into the 2000 campaign. He decided to forget about the long ball and focus on lowering his swing plane. The more grounders and line drives he produced, the better his chance of creating havoc on the basepaths. This single change boosted Johnny to elite-level leadoff status. His average soared to .322, and he still reached double-digits again in doubles, triples and homers. Johnny also led the league with 136 runs and 46 stolen bases. After the 2000 season, the Royals tried to extend Johnny’s contract with an offer of $32 million for five years. Agent Scott Boras advised him to turn it down, play one more year, and test the free agent market. This virtually guaranteed Johnny would be traded, which is exactly what happened. In January of 2001, he was dealt to the Oakland A’s as part of a complex three-way swap. Johnny had a decent year, but nothing like the one that A’s fans expected. After stumbling from the gate, he needed a hot summer to bring his average over .250. He still managed to steal bases and score runs, but he failed to provide much of a spark until the second half. Johnny was firing on all cylinders by October. He had four hits, a walk and two steals against the Yankees in the opening game of the playoffs. But after a pair of victories, Oakland imploded and fell to New York in five games. Johnny, now a free agent, felt terrible about his subpar season. 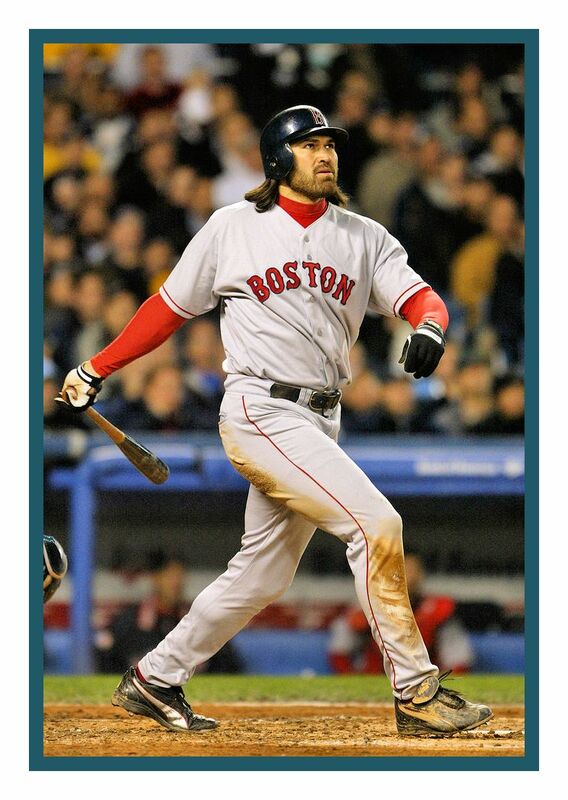 On December 21, 2001, Johnny became a member of the Red Sox. After finishing second to the Yankees four years in a row, they also hired Grady Little as their manager. The pair joined a club that included All-Stars Nomar Garciaparra, Manny Ramirez and Pedro Martinez, plus Derek Lowe, a closer for most of ’01 who was back in the rotation. Ugueth Urbina now held down the ninth-inning job. Sporting an eclectic mix of support players and stars, Boston was starting to develop a somewhat anti-establishment image that helped to distinguish the team from the button-down Bronx Bombers. Johnny, who had cultivated a classic square-jawed, clean-cut look, took a while to come around to this style. But he eventually embraced it and emerged as the franchise’s most recognizable player. Despite the fresh attitude in Boston, the 2002 edition of the Red Sox still finished second by 10 games and missed the playoffs. Johnny had an excellent year, leading the league in triples and topping the club with 31 steals and 118 runs scored. He also covered enough ground in left-center to compensate for the slower and sometimes brain-cramped Ramirez. Boston also enjoyed great performances from Lowe (21 victories), Martinez (Cy Young winner), Urbina (40 saves) and Garciaparra (56 doubles and 120 RBIs). As a team, however, the Red Sox threw a lot of mistake pitches, booted a lot of balls, and left a lot of important runs on the bases. The 2003 Red Sox were a different story. Although they finished second yet again, they went 95-63 and captured the Wild Card. Boston got contributions across the board. The Red Sox bats kept the team in games until the final out. A record six Boston hitters slugged 25 or more home runs. Johnny topped the 100-run mark once again, along with 30 stolen bases. For the Red Sox, their Achilles heel was the bullpen. The Red Sox never found it, and it cost them the pennant. After scoring an amazing comeback in the ALDS against the A’s, Boston pushed the Yankees to Game 7 in the ALCS. With Martinez on the mound, a 5-2 lead and only five outs to go, Little left his exhausted ace in the game, and the Yankees came back to steal the pennant. After the Yankees had so thoroughly gotten inside the heads of the Red Sox, Johnny proclaimed in 2004 that he and his teammates were simply going to stop using their brains. They would henceforth be known as the “Idiots,” with Johnny, Millar and Ortiz quickly establishing themselves as the lead morons. Their childish behavior and clubhouse pranks loosened up the locker room, and Johnny became a legend when he began doing naked pull-ups before games. Under Little, this kind of stunt would have been problematic. New manager Terry Francona, however, saw the benefit of giving his guys some latitude. Johnny’s wild look, meanwhile, was the talk of baseball. His hair fell around his shoulders and a thick beard covered everything other than his eyes, nose and mouth. When he arrived at spring training, he blessed his teammates, and later Bronson Arroyo started wearing a T-short that read “What Curse? We Have Jesus On Our Side.” The more important change in Johnny—he had packed on 15 pounds of muscle—went almost unnoticed. The extra power he flexed enabled him to work pitchers differently. When the count was in his favor, he could pick out a pitch anddrive it with the kind of backspin that would send it rising toward the fences. Behind newcomer Curt Schilling, a healthy Pedro, and an excellent offense top-to-bottom, the Red Sox had a great year. Johnny was the catalyst, with 35 doubles, 20 homers, 123 runs, 19 steals and a .304 average. Thanks to some patient hitters in the eight- and nine-holes, he came up with tons of men on base. He slugged .574 in these situations, and his 94 RBIs were a career high. Although the Yankees were miles ahead in the AL East for much of the season, Boston closed to within three games with 98 wins. For once, there was no fear heading into the postseason. In the ALDS, the Red Sox took care of the Angels in three straight to set up another league championship showdown with New York. The first two games, in the Bronx, went to the enemy, 10-7 and 3-1. Game 3, in Fenway, was a 19-8 embarrassment for Boston, which now trailed 3-0 in the series. No one was hitting, including Johnny. Facing an uphill battle never accomplished by a playoff team, the Red Sox began chipping away at the Yankee bullpen and forced the next two games into extra innings. Ortiz won them both with clutch hits, sending the series back to New York. Schilling, injured in the series opener, made a surprise return to the mound in Game 6 and was dominant in a 4-2 victory. Although the rest of the Red Sox had come to life, Johnny was still slumping badly, with just three hits in the series. Prior to Game 7, Johnny’s teammates told him this was his time to shine. Francona stopped him before he took the field and reminded him that he was a superb player. Infused with confidence, he struck the knockout blow for Boston, greeting reliever Javier Vazquez’s first pitch with a bases-loaded bomb to right for a 6-0 lead in the second inning. The Red Sox cruised in a 10-3 laugher, completing an unprecedented comeback and advancing to the World Series. Johnny’s six RBIs established a new ALCS single-game record. Despite some shoddy defense in Game 1, the Red Sox outscored the St. Louis Cardinals, 11-9. From then on, the Boston pitchers dominated. When Johnny led off Game 4 with a home run, Lowe and the Sox had all the support they needed. Boston finished off its sweep with a 3-0 win that erased 86 years of futility. Johnny batted .286 for the series and led all hitters with four runs scored. Johnny’s 2005 campaign, however, was less than magical. He cut his arm on Toronto’s new scoreboard in April and ran into a wall in May. The collision left him with a sore shoulder and a splitting headache. The headache went away, but his right arm was in pain the rest of the year. Johnny was hit by a pitch on the wrist in August and jammed his left shoulder making a catch in September. Despite playing most of the season at less than full strength, Johnny still made it into 148 games. He batted .316 with 197 hits and 117 runs to go with 10 homers, 75 RBIs and 18 stolen bases. The Red Sox, meanwhile, lost a little of their magic. They blew a lead in the East to the Yankees, and then lost to the Chicago White Sox in the ALDS as the Wild Card. After the season, Johnny found himself a free agent in a market devoid of leadoff hitters. Agent Scott Boras set the bar high for bidders, which scared off a lot of teams. Finally, the Yankees came across with a four-year deal worth more than $50 million. Johnny replaced Bernie Williams as the everyday centerfielder. Johnny’s flair for the dramatic has put the Yankees in something of a quandary for 2010. He is a free agent but has expressed a desire to stay with the club. There is no one waiting in the wings to replace him, except through an acquisition. Has Johnny seen his best days as a major leaguer or is there still more in the tank? That’s a question for intelligent baseball minds—not for idiots. The Yankees then signed outfielder Randy Winn to a one-year $2 million deal which essentially closed the door on Damon's return to the Bronx. On February 22, 2010, Damon agreed to a one-year, $8 million deal with the Detroit Tigers and on April 14, 2010, Damon recorded his 1,000th career RBI against the Kansas City Royals. On January 21, 2011, Damon agreed to a one-year, $5.25 million deal with the Tampa Bay Rays and in 2012, Damon signed a one-year minor league contract with the Cleveland Indians who later released him.